Connect To Learn believes that many of the challenges we face today can be addressed if people from vastly different life experiences can have opportunities to learn from each other, find common ground, and better understand each others' differences. Connect To Learn's School To School Connections program is designed to connect classrooms from different corners of the globe to foster collaborative learning, cross-cultural understanding, and global awareness by leveraging technology and the Internet as tools for bridging classrooms. We work with partner schools to create and adapt curriculum-aligned lessons that integrate use of collaborative online learning platforms, video conferencing, audio calls, emails, and text messaging to facilitate cross-cultural exchange that helps students and teachers illuminate the commonalities and distinctions between each other’s lives. "This workshop really helped me to be a better global citizen." 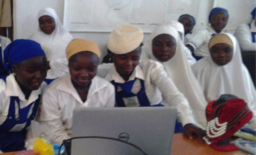 Students have connected to celebrate World Read Aloud Day by reading stories from each others' cultures, have explored parallels between histories of segregation in the US and colonialism in Ghana,and have used online platforms to share and discuss photos exploring each other's local environments. "The Connect To Learn program...has opened our minds to our global citizenship potential. It has become an inspirational source of knowledge about school, literature, and life in Ghana. One of the most interesting discussions we had with our friends at Mansoman was about the political systems of our two countries, and how democracy is manifested." "This project has created a new world for the children of Ruhiira. Their lives will never be the same again. Children have been excited to interact with their colleagues across the ocean and learn that their challenges in school overlap or are the same. 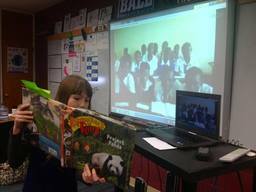 "On a Skype call with children from a school in Sauri, Kenya, I was surprised to find that they could read in their third language, English. This is amazing because most children in America only speak one language.